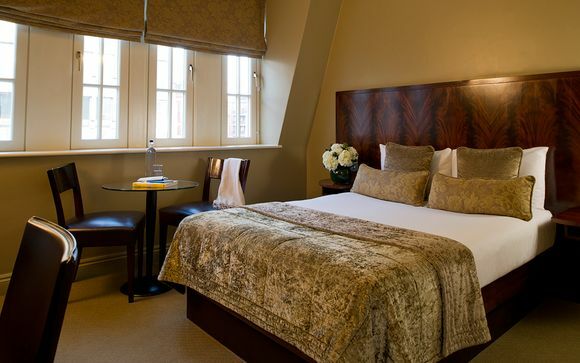 Enjoy the hotel's excellent location in the heart of Fitzrovia. The Grafton is on Tottenham Court Road - a mecca for Electronics and Interior Design stores - with the Eurostar and St. Pancras, Regent's Park, Oxford Street and the West End on its doorstep. London is the ideal place to explore time and time again, whether you visit London regularly or if this is your first time there is enough to keep you coming back! From this great location you are able to experience some of the best known attractions in the country. 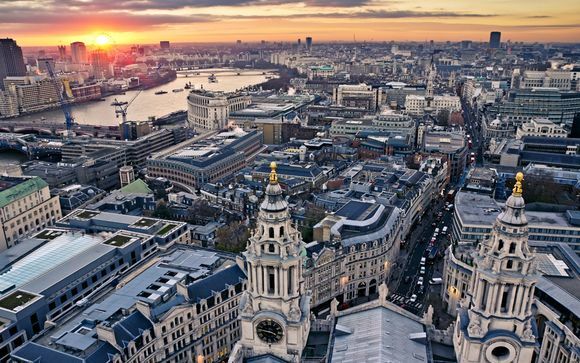 From the London Eye to Westminster Abbey and Buckingham Palace, the central location of the hotel means that you are never far away from anything! For those looking to experience the full variety of London, the West End is only a short walk away, offering fantastic shopping and entertainment of all sorts, from the world famous theatres to a buzzing nightlife that can suit any taste! There's a pleasing buzz to this luxury London hotel that reflects the energy of its Tottenham Court Road location, equally good for the City, the West End or even Paris via St Pancras station. All bedrooms at the luxury 4 star Grafton Hotel have air conditioning and have been ergonomically designed to give guests a comfortable space to work and play in. Sleek furnishings feature designer Italian chairs, crisp Egyptian cotton bed linen, Sicilian marble bathrooms and complimentary wireless Internet access. Standard Rooms have complimentary water and iPod chargers. Within each bedroom you will also find a fridge, in room safe, iron and trouser press, and tea and coffee making facilities. Access to the bedroom floors is by room key only. This offer is based on a bed and breakfast stay. Just for you: Our members will receive a 2 course pre-theatre dinner at Kaspar's Seafood Bar & Grill at The Savoy (on Friday evening). Breakfast at the hotel has only the best ingredients including a hot section, cereal station with several different cereals, dried fruit, seeds and nuts, cold meats, smoked salmon, pastries and fresh breads, fresh fruit juices and much more. Steak & Lobster - With fewer options, this restaurant can focus on perfecting what they do best: 10oz, dry-aged rib-eye steaks and fresh whole lobsters served on the half-shell. Just for you: Our members will receive top price tickets for 'Dirty Rotton Scoundrels the Musical' (show time: 19:30). The hit 2005 Broadway musical Dirty Rotten Scoundrels opened at the Savoy Theatre in London's West End on March 10th 2014 and is based on the 1988 film of the same name which starred Steve Martin and Michael Cane. It has been seen by over 200, 000 audience members who have between them quaffed 9,660 glasses of champagne at the Savoy Theatre. Even the Savoy Hotel's doormen have commented on the laughter from the theatre hitting the doors of the hotel on a nightly basis! 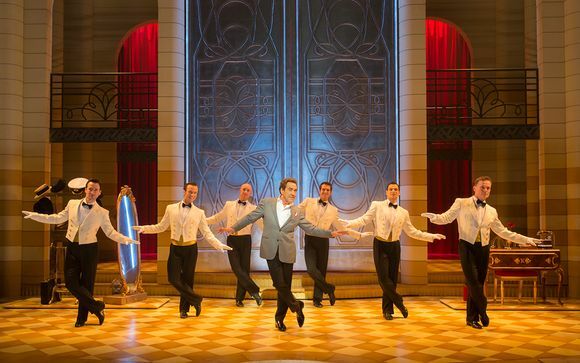 With this reassurance, Dirty Rotten Scoundrels is arguably the best new musical of 2014. From Heathrow: Take the Piccadilly Line and change at Green Park (50 minutes) for the Victoria Line to Warren Street (5 minutes). Take the Heathrow Express train to Paddington (15 minutes). There take the Bakerloo Line to Oxford Circus (10 minutes) and change for the Victoria Line to Warren Street (1 minute). From Gatwick: Take the Gatwick Express train to Victoria (30 minutes). There take the underground on the Victoria Line to Warren Street (5 minutes). From Stansted: Take the Stansted Express train to Liverpool Street Station (45 minutes). Then take the underground on the Central Line to Tottenham Court Road (10 minutes) and change for the Northern Line to Warren Street (3 minutes).